SPILL: Into the 1990s, dams spilled water only when it wasn't needed to generate electricity. Mainstem dams now spill 24/7 during spring and summer migrations to the ocean -- the court's biggest impact on fish survival. 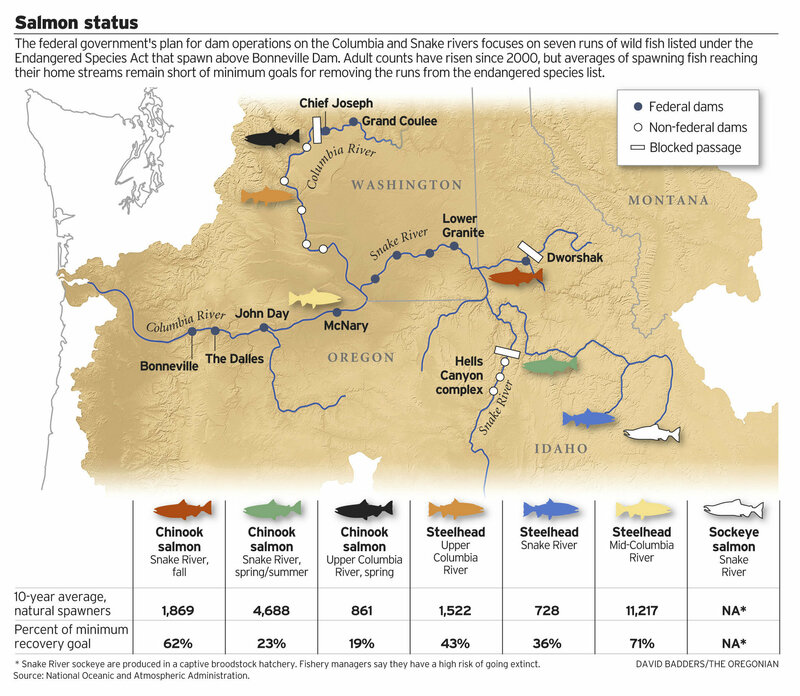 Still drawing fire: plans to stop spill at Snake River dams for two weeks in May and in late August, after young fall chinook mostly finish migrating. DAMS: Eight federal dams that allow fish passage on the Columbia and Snake were built with ladders for returning adults. More recently, those dams installed slides and chutes to help juveniles downstream. Most of those dams meet new survival standards for each dam: 96 percent for spring migrations and 93 percent in summer. Cumulative survival is much lower, but rising. In 2010, about 62 percent of juvenile steelhead survived from the Snake River to Bonneville Dam, the second best total in 12 years of tracking. PREDATORS: Returning adults face sea lions. Juveniles -- including 130 million hatchery fish released each year -- face smallmouth bass, pikeminnow and birds. New measures include expanded wire arrays below The Dalles and John Day dams to shoo birds away. At the Columbia's mouth, the worst awaits: cormorants and terns on two man-made islands that ate about 19 million juveniles last year. RESEARCH: Exhaustive programs track fish from eggs to smolts, through dams, to the ocean and back as adults. Topics range from hatchery impacts on wild fish to sea lion predation to measuring habitat improvement results. For 2010-11, the BPA funded $78 million of research. Leasing or purchasing water rights to increase summer stream flows. Removing or replacing culverts, irrigation diversions or other obstructions, to restore fish access to more than 2,000 miles of tributaries since 2000. Reconnecting flood plains and wetlands to main rivers or spawning streams. HARVEST: Seasons and quotas set on virtually every fish headed up the Columbia with severe restrictions on wild fish -- most hatchery fish have their adipose fins clipped as juveniles to help anglers distinguish them from wild fish. For most of the runs included in the latest court case, fishing mortality ranges from 5 percent to 15 percent, biologists estimate. 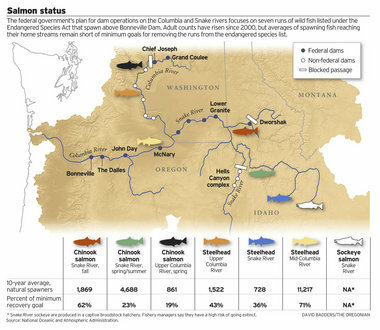 The total is much higher for Snake River fall chinook -- an estimated 45 percent -- because of ocean fisheries.